From fully automated to portable equipment, Rodeco can fit you for the right piece of vibratory, blasting or industrial parts washing equipment to meet your unique needs. For over 60 years, Rodeco has worked with manufacturing companies of all sizes, including GE, Siemens, Flowserve, military installations, commercial aircraft and automotive parts manufacturers. We provide the equipment and supplies to meet all their vibratory, blast and parts washing equipment needs. Whether you need equipment maintenance, want to purchase or lease equipment or need replacement parts, we can help. Contact us today for more information. Rodeco doesn't stop after the sale is made. Ask about our installation and maintenance services for new or used equipment — and training as well! We help you through every step and beyond! Need an affordable way to spread out your capital equipment costs? We guide you through our Equipment Leasing programs specifically designed to fit your needs. CONTACT US today at 800-849-0871 to learn more! 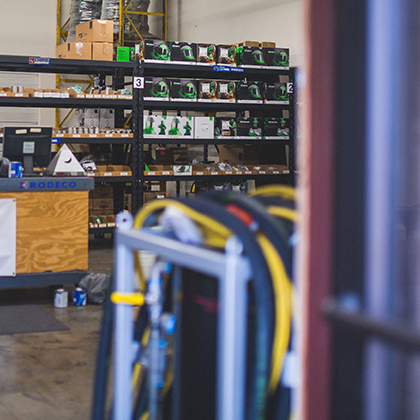 From helmets and suits, nozzles and hoses, to carbon monoxide filters and breathing air testing, Rodeco is a stocking distributor of consumables and safety equipment from RPB and others. The professionals at Rodeco Blast Solutions know the best equipment and measures to meet your unique needs. We also offer consulting and training on how to use the equipment to keep your operators safe on the job. LOOKING TO SAVE A LITTLE MONEY? ask us about previously used equipment.